The Indian Standard specification states it clearly enough: Cornflakes shall be prepared from cleaned, sound corn (Zea mays, also called Indian corn, or maize). The corn shall be scoured, degermed, dehulled, and polished, and then cooked after mixing with malt, sugar, and salt, by flaking, partial drying and finally to toasting. Also: Cornflakes shall be tender and crisp, reasonably uniform in size, of good flavour and golden brown in colour. Cornflakes shall possess good characteristic taste and odour and shall be free from rancid, musty, sour, and other undesirable tastes or odours. The flakes shall be free from living insects and moulds and shall be free from dead insects, insect fragments, and rodent contamination visible to the eye. Sounds like a lot of information, does it? If it does, read through it again. Along with the technical aspect, it is basically reinforcing quality and hygiene standards. 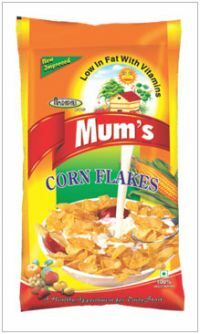 The report that follows covers seven leading brands of cornflakes available in various retail markets of India and tests them on parameters such as moisture and lead, which are crucial in determining whether the cornflake is safe for consumption at all. You can see list of our CV Surveillance Series- Cornflakes below, perform Side-by-Side comparison. If you need further help, do have a look at Conzumr Guides and Tips. Alternatively you can view all Cornflakes to choose your own favourites. The milling process removes the corn kernels from the cobs and turns them into flake-sized ‘grits’. The grits are cooked in steam pressure cookers, at temperatures exceeding 100C. This cooking process lasts for an hour and softens the hard grits. During cooking, additional water is incorporated in the form of steam which condenses and the water content in the batch rises to 30 per cent to 35 per cent. Next, the flakes are tumble-toasted in huge cylindrical ovens. The air in the ovens is heated and the flakes are tossed around in a rotating drum. The drum is angled so that the flakes whirl around and pass through it quite quickly, and stops them spending too long in the fierce heat. Here the flakes are sprayed with flavors and minerals. Finally, they are bagged up with the help of a bagging machine. Cornflakes shall be packed in high-density polyethylene bags alone or they shall be first packed in high-density polyethylene bags, properly sealed, and then placed in cardboard cartons. As per Indian Standard, the bags used for packing cornflakes shall be made of 300 gauge high-density polyethylene of thickness 0.075 mm. Has correct labellings. 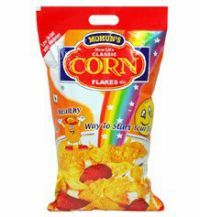 Corn Flakes Mix (proprietary food) : Has correct labellings. Has correct labellings. Corn Flakes : Has correct labellings. Has correct labellings. Corn Flakes-based Breakfast Cereal (proprietary food) : Has correct labellings. All brands had correct labelling. Passed this test. Corn Flakes : Passed this test. Passed this test. Corn Flakes Mix (proprietary food) : Passed this test. Passed this test. Corn Flakes-based Breakfast Cereal (proprietary food) : Passed this test. As per FSS Regulations, in cornflakes the ash insoluble in dilute HCL content – an indicator of dirt and dust in the product – shall not be more than 0.1per cent by mass (on dry basis). Low ash content is good for consumers. All the seven brands passed this test. The least amount was found in Patanjali, followed by Mum’s. Lead content was not detected in any of the brands. Within the specified limit. Corn Flakes Mix (proprietary food) : Within the specified limit. Within the specified limit. Corn Flakes : Within the specified limit. Within the specified limit. Corn Flakes-based Breakfast Cereal (proprietary food) : Within the specified limit. As per Indian Standard and FSS Regulations, moisture content in cornflakes shall not be more than 7.5 per cent by mass. It may be noted that cornflakes with less amount of moisture is better as it translates into a longer shelf life. Moisture content in all the brands was within the specified limit. The least amount was found in Patanjali, followed by Kellogg’s. Dietary fibre has many health benefits. It can reduce one’s risk for heart disease, diabetes and some cancers, and also help in weight control. Fibre is important for digestive health too. Dietary fibre was highest in Diet n Lite (5.34 percent) and lowest in Bagrry’s (2.16 per cent). Protein is an essential nutrient. It plays an important role in cellular maintenance, growth and functioning of the human body. Protein in cornflakes is considered to be better. The highest amount of protein was found in Mum’s (10.8 per cent) and the lowest in Tops (5.80 per cent). It is used for seasoning as well as food preservation. Salt also inhibits the growth of bacteria in a food item. In most of the cornflakes brands, sodium chloride and sodium bicarbonate have been added in the end product for better shelf life, uniform texture and acceptability of taste.The daily requirement for sodium intake in the average diet is a maximum two grams. No requirement has been specified in the national standard for salt content in cornflakes. It should, however, be added in moderate quantity. Salt content was lowest in Tops (419 mg/100 gm) and highest in Diet n Lite (689 mg/100 gm). As per the Indian Standard and FSS Regulations, the percentage of total ash, excluding salt, in cornflakes shall not be more than 1.0 per cent (on dry-weight basis). Total ash in all brands was within the maximum permissible limit. It was lowest in Tops (0.54 per cent) and highest in Kellogg’s (0.80 per cent). Acid-insoluble ash indicates the presence of sand, dirt and dust. As per the Indian Standards, acid insoluble ash in dilute HCL in cornflakes should not be more than 0.05 per cent; as per FSS Regulations, it should not be more than 0.1 per cent (on dry-weight basis). Acid-insoluble ash was found within the specified limits. It was lowest in Kellogg’s and Reliance (0.020 per cent), and highest in Patanjali (0.035 per cent). As per FSS Regulations, alcoholic acidity (with 90 per cent alcohol) of cornflakes should be equivalent to not more than 2.0 ml. All the brands met the requirement for alcoholic acidity. Moisture generally refers to the presence of water in a product. It may be noted that cornflakes with less amount of moisture is better as it translates into a longer shelf life. As per Indian Standard and FSS Regulations, moisture content in cornflakes shall not be more than 7.5 per cent by mass. Moisture content in all the brands of cornflakes was within the specified limit. The lowest moisture content was in Mohun’s (2.24 per cent), followed by Murginns (2.98 per cent). Patanjali was found with higher moisture content (4.94 per cent). Energy value is the amount of calories which our body obtains from food. While there is no requirement prescribed in the national standards, energy value is expected to be higher in cornflakes. Among the tested brands, energy value was highest in Kellogg’s (388 kcal/100 gm), followed by Murginns (387 kcal/100 gm). Crude fibre is a measure of the quantity of indigestible cellulose, pentosans, lignin and other components of this type present in food. As per Indian Standards, crude fibre should not be more than 0.75 per cent in cornflakes. Crude fibre was found within the specified limit in all the brands of cornflakes. The test is conducted to check the small/breakage pieces/coarse powder of flakes. Not more than eight per cent (by mass) of the material shall pass through a 2 mm sieve. All the brands passed in this test. Carbohydrates are a source of energy. Carbohydrates are the sugars, starches and fibres found in fruits, grains and vegetables and milk products. Though often maligned in trendy diets, carbohydrates are one of the basic food groups and are important to a healthy life. No requirement for carbohydrates in cornflakes has been specified in the national standards. Carbohydrates percentage was highest in Tops (88.5) and lowest in Mum’s (83.61). Iron, one of the most abundant metals on earth, is essential to most life forms and to normal human physiology. Iron is an integral part of many proteins and enzymes that maintain good health. It expected to be higher in cornflakes. This is an important parameter in terms of brands’ claim verification – most of the brands of cornflakes make claims of being iron-fortified. Iron was found highest in Murginns (22.27 mg/100 grams), followed by Kellogg’s (11.73 mg/100 grams). It was lowest in Mohun’s (0.75 mg/100 grams). The fat component adds richness of flavour and contributes to a smooth texture. In cornflakes the fat content may be due to presence of corn’s natural oil. There is no requirement for fat content in the national standards. Fat in the tested brands was found between 0.12 per cent (Tops) and 1.22 per cent (Patanjali). Some of the brands made claims of being ‘low in fat’. Microbiological contamination is a very serious issue for food products. For cornflakes, we conducted tests for total plate count (TPC) as well as yeast and mould. These microorganisms are responsible for many food-borne diseases. Due to improper or poor hygienic condition during the manufacturing process, microorganisms may occur in the finished product. TPC ranging from 55 cfu (Bagrry’s) to 636 cfu (Mohun’s). 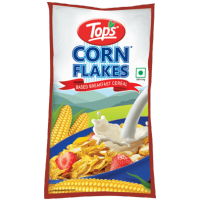 Corn Flakes Mix (proprietary food) : TPC ranging from 55 cfu (Bagrry’s) to 636 cfu (Mohun’s). TPC ranging from 55 cfu (Bagrry’s) to 636 cfu (Mohun’s). Corn Flakes : TPC ranging from 55 cfu (Bagrry’s) to 636 cfu (Mohun’s). (1,820 cfu/100 gm) slightly higher total plate count. 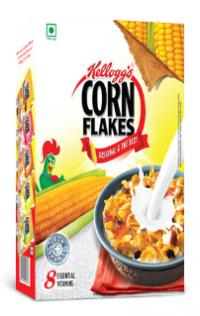 Corn Flakes-based Breakfast Cereal (proprietary food) : (1,820 cfu/100 gm) slightly higher total plate count. Sensory panel tests were conducted in a test lab with volunteers, under the guidance and supervision of technical experts. These five attributes were judged by the panellists and ratings were then given on a five-point scale: namely colour and appearance, flavour, taste (with milk and without milk), aftertaste feel and overall acceptability. Savour was the most liked brand among panellists, and was followed by Diet n Lite and Murginns. To Recieve updates and possible rewards for Cornflakes please sign in.